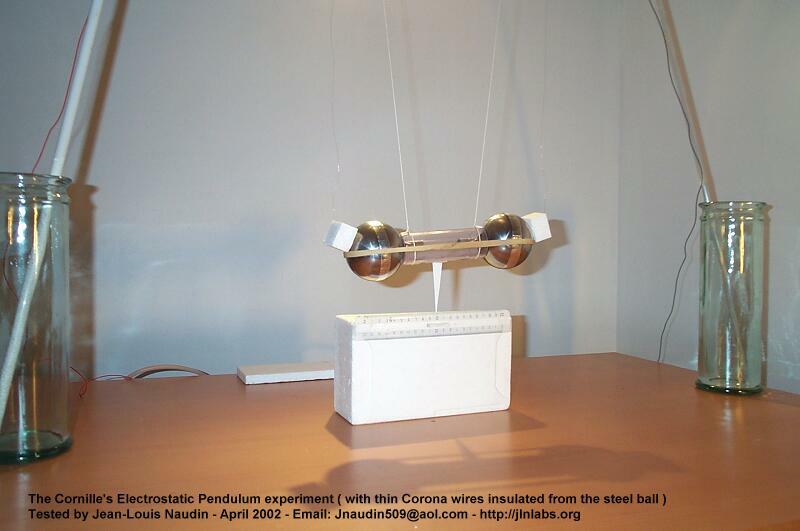 The purpose of this experiment is, firstly to replicate the original Patrick Cornille's Electrostatic Pendulum and secundly to indentify the real source of the "anomalous" thrust in his device with a deep investigation. These tests are conducted with full electronic HV Bipolar Power Supply which allows accurate Voltage and Current measurements. These tests are more accurate than the tests that I have already conducted on September 11, 1997 with a simple Wimshurst Machine. 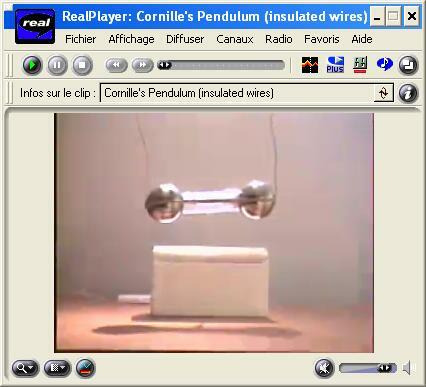 Tested apparatus description : The Cornille's electrostatic pendulum is composed of two steel balls ( 70mm diam, 700g weight ) separated by a plastic cylinder (105mm length). These 2 two steel balls are electrically connected through a 40 KV spark gap placed between them and inside the plastic cylinder. A rubber band maintains together the steel balls and the plastic cylinder as shown in the photos above. The Apparatus is suspended through two thin ropes to the lab ceiling and two thin copper wires ( 12/100 mm diam ) are used to convey the High Voltage. The total weight of the apparatus is 1450 g and the total lenght of the pendulum is 1200 mm ( see the full diagram, below ). TEST #1 - RESULT : The High Voltage ( 34 KV DC bipolar ) has been choosen so as to be lower than the threshold voltage of the spark gap ( 40 KV ). There is a weak leakage current inside the spark gap which contributes to provide a weak current flow through the two masses ( the 2 steel balls ). 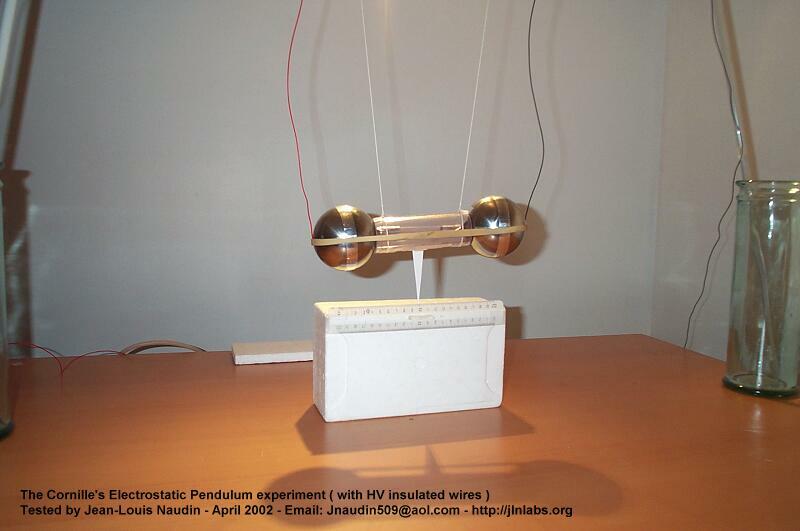 When HV pulses are sent ( at a period of about 2 seconds ) the Cornille's pendulum oscillates with an amplitude of +-10mm from its neutral position. 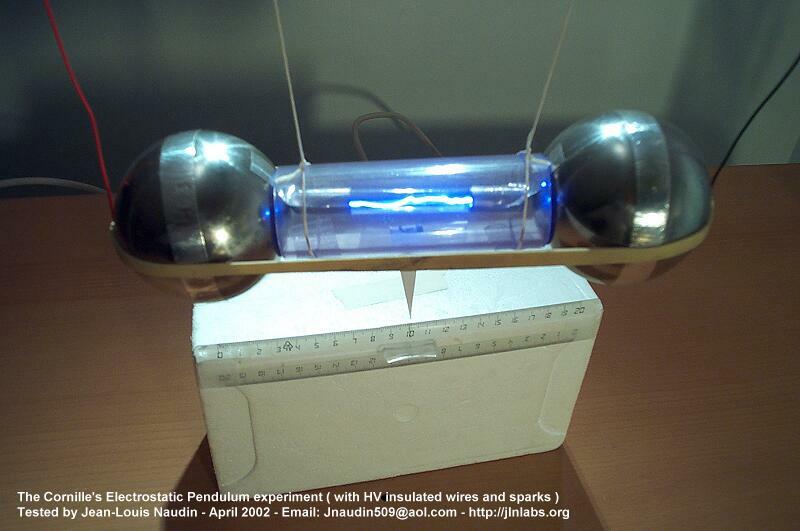 THE TEST#1 OF THE ELECTROSTATIC PENDULUM CONFIRMS THE ORIGINAL OBSERVATIONS DONE BY PATRICK CORNILLE HIMSELF ON JULY 27, 1996 : When HV pulses are sent to the electrostatic pendulum, a stimulated force sets the device into motion. This test is similar to the previous test. Only the thin corona wires have been replaced by full insulated wires. TEST #2 - RESULT : As in the previous test, the High Voltage ( 34 KV DC bipolar ) has been choosen so as to be lower than the threshold voltage of the spark gap ( 40 KV ). The weak leakage current inside the spark gap contributes to provide a weak current flow through the two masses ( the 2 steel balls ). 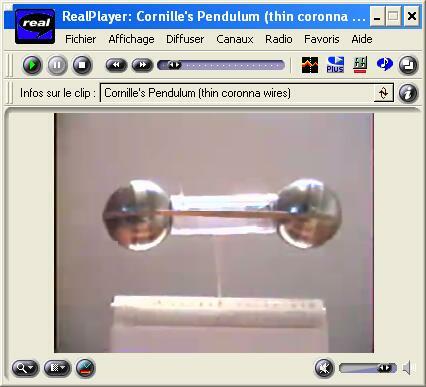 When HV pulses is sent ( at a period of about 2 seconds ) the Cornille's pendulum doesn't oscillate. There is NO OBSERVABLE MOTION of the pendulum. NO OSCILLATION of the device has been observed. In this experiment, the High Voltage has been choosen so as to get a spark when the HV Power supply is switched on. 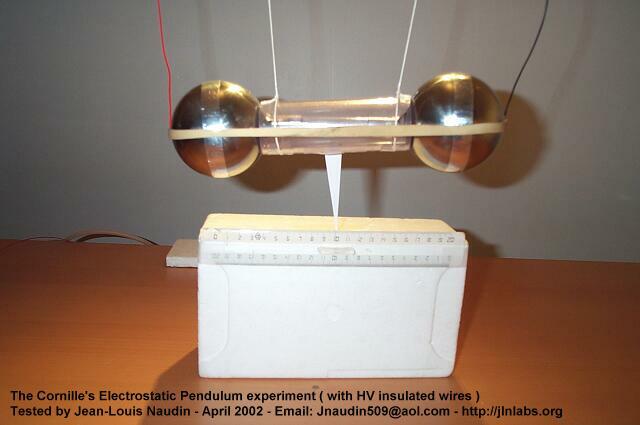 The HV current pulse is about 3 mA and flows through the two masses ( the 2 steel balls ) as shown in the photo below. TEST #3 - RESULT : The High Voltage ( 50 KV DC bipolar ) has been choosen so as to be higher than the threshold voltage of the spark gap ( 40 KV ). There is a strong current ( 3 mA ) inside the spark gap during the pulse, this current flows through the two masses ( the 2 steel balls ). 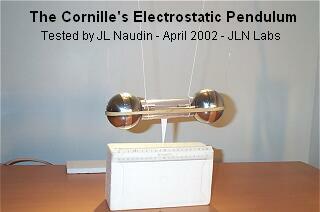 When HV pulses are sent ( at a period of about 2 seconds ), the Cornille's pendulum doesn't oscillate. There is NO OBSERVABLE MOTION of the pendulum. 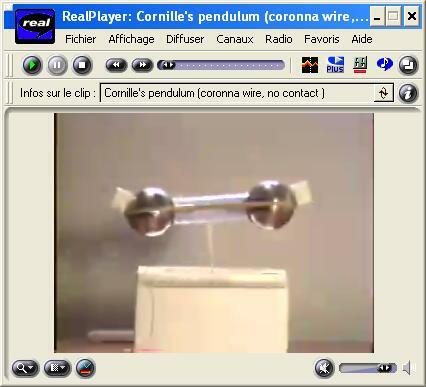 TEST #4 : WITH CORONA WIRES INSULATED FROM THE STEEL BALLS. 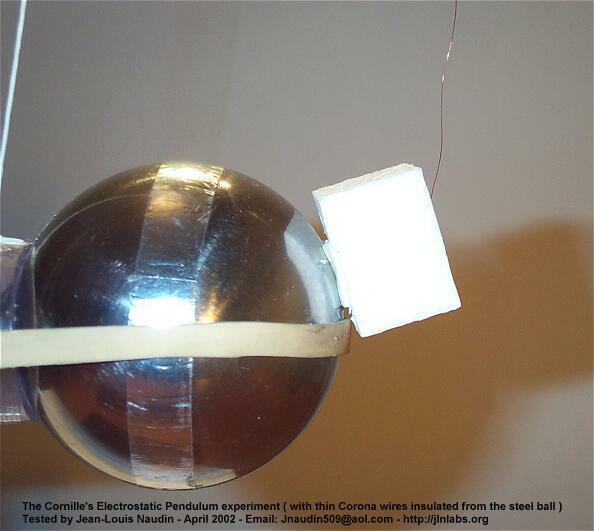 In this new test, the two electrical connections of the thin wires on the two masses ( the steel ball ) have been fully insulated with a thick polystyren block and an adhesive tape as shown in the photos below. In this case, there is NO POSSIBLE CURRENT FLOW through the two masses and there is only a leakage current in the air and in between the two thin wires. TEST #4 - RESULT : The High Voltage ( 34 KV DC bipolar ) has exactly the same value than in the TEST#1. 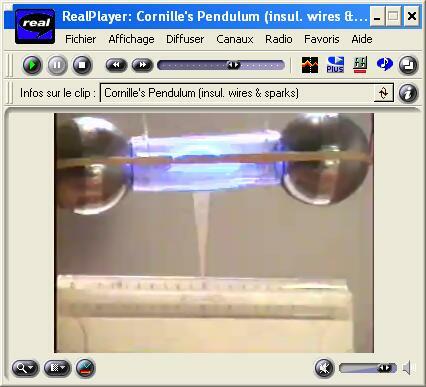 When HV pulses are sent ( at a period of about 2 seconds ) the Cornille's pendulum oscillates at the same period and with the same amplitude than in the TEST#1. 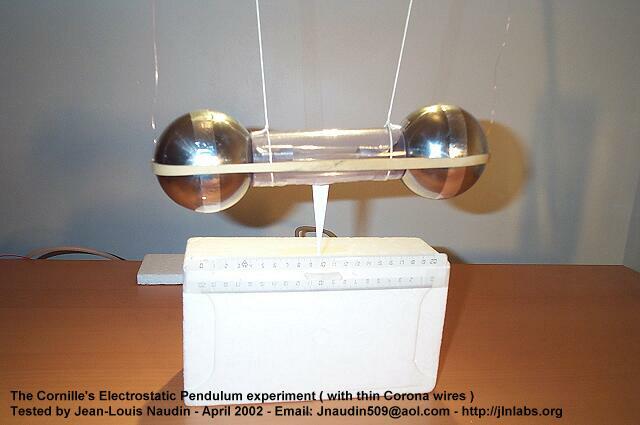 the Cornille's pendulum oscillates with the same amplitude than the TEST#1. - How a such symmetrical configuration ( two equal (diameter and length) thin spaced wires ) is able to generate a directional thrust ? This can be simply explained by the fact that the ionic mobility of positive ions in the air, 1.32 (cm/sec)/(volt/cm), is less than the ionic mobility of negative ions in the air, 2.51 (cm/sec)/(volt/cm). The concentration of the electric field near the thin wire produces a corona discharge. Positive ions are generated at the wire, the wire positively charged repels the ions and thus the force on the wire is roughly equal to that on the ions. The negative/positive mobility of ions ratio is about 1.9, so the force on a positive conductor is greater than on a negative conductor, this is the cause of the generation of an unidirectionnal thrust... The ES pendulum goes to the LEFT when the HV is switched ON. ( by the corona discharge in the air ) between the two thin copper wires. 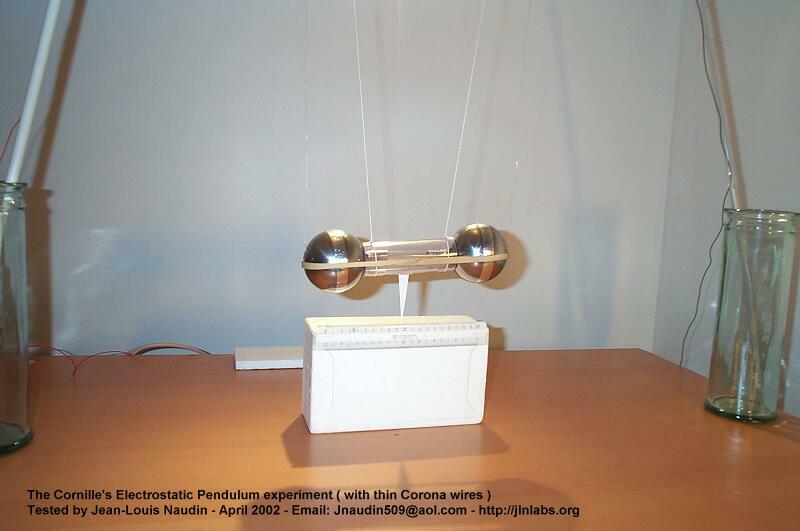 This serie of tests about the Cornille's electrostatic pendulum has fully demonstrated that the real source of the thrust induced on the device and responsible of its oscillations is only produced by a simple EHD Effect. This EHD Effect is generated by the corona discharge effect in the air between the two thin copper wires which carry the High Voltage. These EHD forces are mechanically transmitted to the masses and produce a common parametric excitation of this pendulum. The shape and the structure of the masses have no importance in this case ( conductive or not conductive, single or two masses, spaced or not spaced ). Additional comments from Scott Little ( 09-04-02 ): "The reason the forces are not symmetrical is due to the fact that the positive wire (on the left) is NEXT to a negative wire (on the right). When the HV is on, negative ions are created around the negative wire and, due to their higher mobility, they move over to the positive wire quickly, exerting only a short-duration electrostatic attraction force for the positive wire. But the positive ions created at the positive wire move slowly and thus create a longer-acting electrostatic attraction force for the negative wire. The result is a force towards the left when the HV is on. "